Dark Chronicle,[a] which was released as Dark Cloud 2 in North America, is an action role-playing game developed by Level-5 Inc. and published by Sony Computer Entertainment for the PlayStation 2. It was released in Japan in November 2002, in North America in February 2003, and in Europe in September 2003. The game is a spiritual sequel to a 2000 game titled Dark Cloud, with which it shares the same basic game mechanics—action role-playing, fantasy sandbox, and elements of city-building games—but features different characters and an unrelated plot. Players control two main protagonists, Max and Monica, who come from the present and future, respectively. They must work together to stop the game's main antagonist Emperor Griffon, who wishes to destroy the present from deep in the past. The game was met with positive reviews from critics, who praised the improvements over the first game—particularly the graphics and variety of gameplay styles available. Some reviewers, however, were critical of the storyline. Dark Chronicle won several gaming awards and sold almost 250,000 copies in Japan in its first four weeks of release. In January 2016, an emulated version of the game was made available for the PlayStation 4 through the PlayStation Network. Combat in Dark Chronicle. Monica lifts up a rock to throw at an approaching enemy. Dark Chronicle is an action role-playing game played from a third-person perspective. The player moves through procedurally-generated dungeons, battles monsters and collects items. Through most of the game, players control characters Max and Monica; Max fights with a wrench as his melee weapon and a gun as his ranged weapon. Monica uses a sword and a magical bracelet. Combat in the game uses real time hack and slash techniques. Unlike most action role-playing games in which the characters level-up, weapons in Dark Chronicle attain absorption points (ABS) with each kill; once a certain number of points have been gained, the weapon is automatically leveled up. As weapons level up, their number of "Synthesis Points" increases, determining how many "spectrumized" items can be attached to it. Most items in this game can be broken down, or "spectrumized", which turns the item into a "SynthSphere" that can be attached to a weapon to raise specific stats, depending on the its properties. Attachments cost synthesis points; when the weapon's points are depleted, no more attachments can be made until the weapon is leveled up and more synthesis points are attained. Weapons can also be spectrumized but the resulting SynthSphere will be unstable unless the weapon is level five or higher. When attached, instability will result in minimal stat growth. A spectrumized level-five weapon will result in considerable stat growth. Weapons can be "built-up" into a more powerful weapon if it has a certain number of specified stats; some weapons also require the player to have defeated particular types of enemies. Built-up weapons gain strength and revert to level one; building up is the only way to acquire each character's most powerful weaponry. As in Dark Cloud, weapons wear out over time and must be repaired to avoid breakage. In contrast with Dark Cloud, broken weapons do not disappear from the players' inventories but become unusable until repaired and lose some of the ABS they have accrued. As in the previous game, characters can only grow stronger by consuming particular items that increase their health points and defense. Georama mode in Dark Chronicle. 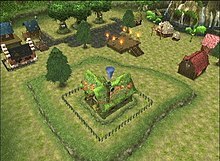 Here, the player places a house on a previously placed hill in Sindain to affect events in the game's future world. 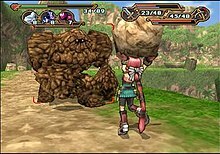 A major component of Dark Chronicle's gameplay involves special items called "Geostones" which are used to rebuild the world outside the dungeons. When removed from the dungeon, Geostones can be placed into the database of a machine called the "Carpenterion", which turns them into plans for building objects, including houses, trees, lights and rivers, which the player may build once the plans are available and the player has the necessary materials. At this point, the player can enter "Georama mode"—a gameplay mode similar to city-building games—and arrange the pieces on the landscape. Buildings can then be populated with villagers recruited from other levels throughout the game. Certain conditions must be met for each village; when each condition is completed, something significant in the future changes. The player's completion of these conditions is recorded as a percentage. Each Georama map must complete as many of the conditions for that map as possible; it is not necessary to achieve 100% to advance the plot in any map, but doing so earns the player bonus items. The player can recruit non-player characters (NPCs) onto their teams at various points in the game by performing specific tasks. These characters are never controllable and do not appear in battle, but players can access a party member's special ability through the "Characters" portion of the menu. Each character has a different ability and only one can be active at a time. Some characters can influence a battle, such as increasing item drops and adjusting enemy behavior; others can produce certain items inside or outside dungeons. Fishing is another feature of the game; players can catch fish to breed and train in their fish tanks. Later in the game, players' fish can be entered into weigh-in competitions and races. The game also has an invention system with which players take photographs of various items and combines them to generate ideas for inventions, which can be created if players have the required materials. Players can also build a customizable robot called the "Ridepod" that can be used by Max in battle, and transform Monica into monsters by collecting badges,  also used to play "spheda"—a sport similar to golf—in completed dungeons. As the game begins, a girl runs to her father's room in a castle. A group of creatures attack her; she defeats them and enters the room, where she finds a man standing over her dead father's body. The man disappears in a ball of light. Max (Megumi Kubota/Scott Menville) is a boy from the town of Palm Brinks. He attends a circus and overhears a conversation between the ringmaster Flotsam (Chafurin/Phil Proctor) and the town mayor Need (Mitsuru Ogata/Alan Oppenheimer); Flotsam pressures Need to find a stone and threatens to cause panic by telling the town's people—who never leave its confines—about occurrences in the outside world if the stone is not found soon. Flotsam sees Max and realizes Max's red pendant is the stone he is seeking. Max flees and leaves town to find out what is going on. He also hopes to find his missing mother. Outside the town, Max meets his boss Cedric (Hiroshi Naka/Paul Eiding) and Need on the town's train, Blackstone One. Cedric explains that fifteen years ago Emperor Griffon destroyed the world but spared Palm Brinks because he believed a special stone was hidden there. Flotsam attacks Blackstone One and is defeated by the girl from the castle, who is Princess Monica Raybrandt (Hiroko Taguchi/Anndi McAfee) from 100 years in the future. The train stops near Sindain; Monica speculates that the Great Elder Jurak may reveal Griffon's identity if they restore his origin point. Griffon has sent his men to Max's time to alter the origin points of Monica's time, rewriting history and eliminating any opposition. Griffon has erased Jurak from existence by altering his origin point. Monica and Max set about restoring Jurak's origin point; Monica says Max's stone pendent is a red atlamillia that allows passage into the future; Monica's blue atlamillia allows passage to the past. They rebuild Sindain and go to the future to see Jurak (Tadashi Miyazawa/Gregg Berger), who says Griffon is from the distant past and advises them to speak to the great sage Crest. At Balance Valley the party restore Crest's erased origin point. They encounter Argo (Tomomichi Nishimura/Neil Ross), who tells them the young Crest has died and only his apprentice Lin (Fumiko Orikasa/Kim Mai Guest) remains. Max and Monica rewrite Crest's history to avoid his death. They go to Moon Crystal Lighthouse and travel into the past; Lin and Crest (Susumu Chiba/Scott McAfee) are attacked by a warship Death Ark, captained by Gaspard (Takahiro Sakurai/Rino Romano), who killed Monica's father. They cannot prevent Crest's death but Lin vows to become a legendary sage. Max and Monica go to the future and meet Madam Crest—an elderly Lin—who tells them Griffon comes from 10,000 years in the past; a jump only the scientists at the Luna Lab can make. Max and Monica restore the Lab's erased origin point and visit the future, where the Lab's head scientist Dr. Nobb (Motoko Kumai/Ryan O'Donohue) shows them plans for a time-traveling train called Ixion, which can take them 10,000 years into the past. Word arrives that a battle with Griffon's army is taking place; the rebels' leader Elena (Hiroe Oka/Kath Soucie) contacts Nobb. Max recognizes Elena as his mother, who is from Monica's time. The rebels learned Griffon had a gold atlamillia and was seeking the other two stones. Monica's father, who Gaspard killed, owned the first stone. The rebels then located the final stone, owned by Max's father Gerald 115 years in the past. Elena traveled back in time to protect Gerald; they fell in love and had Max. Five years later, Elena had to return to the future to aid the rebels. Nobb suggests the rebels can withstand Griffon by rebuilding Paznos, a massive mobile fortress. Max and Monica travel to the village Heim Rada to restore the Gundorada Workshop's origin point. They are again attacked by Death Ark; they confront Gaspard, who is fighting for his changeling father who died when he was a child; he and his mother (Rikako Aikawa/Samantha Newark) were run out of town. Before dying, Gaspard's mother him he must find something worth protecting; Gaspard has not achieved this and he now lives for hatred. He tells Max and Monica they must defeat Griffon and asks to join them. Griffon's magic turns Gaspard into a dragon and forces him to fight them, and they reluctantly kill him. A child Gaspard is then shown meeting his mother. Max and Monica return to the future and find Paznos has been built. Griffon's army is defeated and Luna Lab tells them the Ixion is complete. They head 10,000 years into the past and meet Griffon (Fumiko Orikasa/Kath Soucie), a young moon-person who lives in Moon Flower Palace. He steals their atlamillia and changes into his real form (Taiten Kusunoki/Mark Hamill). Griffon plans to summon the Star of Oblivion, which will destroy all life on earth and allow a new, better world to grow in its place. He transports his palace into the sky of Max's time and begins destroying the world. Max and Monica use Ixion to travel to Kazarov Stonehenge and bring Paznos to Max's time. Paznos attacks the Moon Flower Palace, which crashes to the ground. Max and Monica face Griffon at the Palace. They meet a woman named Alexandra (Mayumi Yanagisawa/Jeannie Elias), who tells them she owns the Palace and that they fought an orphan child called Sirus, whom Alexandra adopted. Sirus has forgotten his childhood because of the evil inside him. Alexandra asks them to restore the palace's garden to remind Sirus of his old life. They do so and confront Griffon, who experiences a memory of Sirus lamenting that humans have nearly destroyed the world fighting for the atlamillia. These memories weaken Griffon; Max and Monica defeat him and he turns back into Sirus. A Dark Element (Hiroshi Iwasaki/Cam Clarke) rises from Sirus' body and calls the Star of Oblivion. The Element reveals it was born from Sirus's hatred of humans and plans to rule over the destroyed earth. Max, Monica and the mortally-wounded Sirus defeat the Element. Sirus stops the Star of Oblivion and dies, rejoining Alexandra in the garden. At Kazarov, Max and Monica say goodbye. Elena says goodbye to Max and Paznos returns to its own time. In the game's optional epilogue, Need asks Max to find some Zelmite ore to fuel Blackstone One. In the mine, Max is joined by Monica, who has used a Starglass from Madam Crest to travel back in time. The mechanical remains of Flotsam attacks them; they defeat it and reach the end of the mine. They find the Zelmite the Dark Genie from Dark Cloud attacks them. They defeat the Genie and return to Palm Brinks with the ore.
An early cutscene showcasing the cel shading on Max, along with Level-5's "tonal rendering", which applies smooth shaded foreground characters on detailed backgrounds. Rumors about Dark Chronicle first appeared on April 9, 2002, when Level-5 Inc. updated its website with an image of a silhouette from its newest game, although no other details were made available at the time. The game was officially announced on May 16, when Level-5 launched a full website that revealed the new game would include Dark Cloud's Georama mode and had more features than had its predecessor. The site also demonstrated the cel-shaded graphics and featured pictures of the two protagonists. "You can fill your world with anything you want to invent. But there are things that we can not create - the unquestionable truths of today, and of course our own memories and even history itself." More information was revealed at E3 later in May, when Sony Computer Entertainment announced the game would be released in Japan and Europe as Dark Chronicle and in North America as Dark Cloud 2, with a release date of late 2002 to early 2003. The invention system, which according to Sony would feature over 100 hours of gameplay, was also demonstrated for the first time. IGN and GameSpot both featured previews of the game based on the E3 demo; IGN focused on the improved Georama system and praised the cel-shaded graphics, and GameSpot looked at the dungeons, finding the combat improved from the first game. The visual style of Dark Chronicle departs from that of Dark Cloud by using cel shading. Level-5 referred to the graphic style as "tonal rendering"; the main characters have a smooth, shaded look and the backgrounds have detailed textures and lighting. The main characters have a higher polygon count than the supporting characters and are composed of 2,500 to 3,000 polygons. Supporting characters are composed of 1,500 to 2,000 polygons. The game's graphics were created with Softimage 3D. Cutscenes use the models that are used in normal gameplay, both of which are generated in real-time; thus costume changes are carried over from gameplay to cutscenes. Akihiro Hino, the game's writer, director, designer and producer, stated that "smooth transitions between gameplay and event scenes help increase the empathy for the game". Soft textures were used to create a uniform feel for the visuals and to minimize the computer-generated appearance of the cel shading. Texture mapping was used occasionally to emulate lighting. The game's production took almost two years; the CG production and game development occurred simultaneously. The game's music was composed, arranged and produced by Tomohito Nishiura. The two-disc, seventy-seven track album Dark Chronicle Original Sound Tracks was released in Japan on February 19, 2003, by Scitron. GameSpot's Brad Shoemaker wrote that "Dark Cloud 2's music ranges from good to excellent, and said, "generally there are enough tunes that you won't get too bored of hearing any particular one". IGN's Kaiser Hwang wrote, "the music in Dark Cloud 2 ranges from really good, to really really good, to exceptionally good". On April 21, 2004, the twelve-track album Dark Chronicle Premium Arrange was published in Japan by TEAM Entertainment. It consists of remixes of some of the tracks from the game and features contributions from some of the Japanese video game industry's top composers, including Yasunori Mitsuda, Shinji Hosoe, Motoi Sakuraba, Yoko Shimomura, Noriyuki Iwadare, Kenji Ito and The Black Mages. Rumors of a version of Dark Chronicle for the PlayStation 4 originated in September 2015, when the game received a PEGI rating. In November, Sony confirmed the PlayStation 4 would be getting PlayStation 2 emulation. Games would feature 1080p graphics via up-rendering, trophy support, Remote Play and Share play compatibility, and second screen support for the PlayStation Vita and the PlayStation App. The first batch of games were released on December 5, 2015. On January 14, 2016, the PlayStation Blog confirmed Dark Chronicle would be released the following week. The game was made available through the PlayStation Network on January 19 that year. A sequel, potentially titled Dark Cloud 3, was first rumored to be in development for PlayStation 3 in an alleged leak published in 2006 by PSMania [it], which said Level-5 was aiming for a March-2009 release. In 2009, Level-5 manager Yoshiaki Kusuda stated that although the company did not have a "specific plan for a sequel", it would "seriously consider making it" if fans asked for it often enough, leading Kotaku writer Stephen Totilo to encourage readers to request the game. Totilo reported in 2010 and again 2012 that several people had misread the original 2009 interview and were e-mailing him and asking him to make it. Reporting on a 2017 interview that Level-5 CEO Akihiro Hino gave to Nikkei Business Publications, Rolling Stone lamented that Dark Cloud 3 was not among Level-5's plans for the Nintendo Switch. Hino told Polygon Level-5 could not produce a new Dark Cloud game on its own because the license is co-owned by Sony Computer Entertainment. Dark Chronicle received generally favorable reviews, with an aggregate score of 87 out of 100 on Metacritic, based on forty-one reviews. GameSpot's Brad Shoemaker scored the game 9 out of 10, calling it "one of the finest games released for the PlayStation 2 so far" and "an aesthetic masterpiece". He praised the variety of the gameplay, writing "there's so much to do that it's almost overwhelming" and concluded that "Dark Cloud 2 is simply a class act all the way. Every element of the game, from the georama system to the weapon upgrading to the interaction with a large cast of characters, displays a polish and attention to quality that you find only in real classics." IGN's Kaiser Hwang also scored the game 9 out of 10, calling it "arguably the best looking PS2 game out there". He concluded that "Dark Cloud 2 takes the standard sequel road and gives us everything that made the original Dark Cloud great, only bigger and better ... The leap in quality between the two games really is amazing. From the incredible graphics, to the great sound, to the refined gameplay, Dark Cloud 2 just oozes of quality and polish." Eurogamer's Ronan Jennings also scored the game 9 out of 10, writing "it deserves credit for making us focus on actually doing things. Its qualities aren't designed to bring quick gasps from casual gamers—they are designed to keep people like you playing for hours on end. Add great graphics, decent music and quality voice acting to the mix and there's not much to say against it." " GameSpy's Christian Nutt scored the game 4 out of 5, saying it fell just short of being a classic; "the biggest and most obvious problem with the game has to be its story. There was not a single, solitary moment during the game where I was even the slightest bit interested in or entertained by its copious, well-voiced, cinematic sequences." He concluded "There's no question in my mind that Dark Cloud 2 is one of the most solid RPG adventures for the PS2; but ... it doesn't quite live up to its potential. If Level-5 had worked out all of the kinks, it'd be one of my favorite games for the PS2. Sadly, it's not. While it has my grudging respect, there are many games that I prefer, thanks to DC2's idiosyncrasies." Game Revolution's Johnny Liu awarded the game a B, praising the graphics and variety of gameplay but said it became somewhat repetitive towards the end; "Dark Cloud 2 is very serial in nature. It's a game you can pick up and play for a few hours, stomping though a few dungeon floors, trying to solve a problem or two, but after a while it meanders towards repetition. In truth, the game is filled with innumerable challenges, likable characters and a high production value. But beneath the surface, the lightweight story and characters combined with the almost rigidly episodic game flow still hold it back." Dark Chronicle sold well in Japan; by the end of 2002 it had sold 235,917 units, making it the 47th best selling PlayStation 2 game of the year. The game won "Best PlayStation 2 Game" (2003) from GameSpot, and "Console Role Playing Game of the Year" (2003) from the Academy of Interactive Arts & Sciences. It was also nominated for "Best Adventure Game" at the 1st British Academy Games Awards, losing to The Legend of Zelda: The Wind Waker. It received a "Silver Award" from Electronic Gaming Monthly and a "Bronze Award" from PSM. 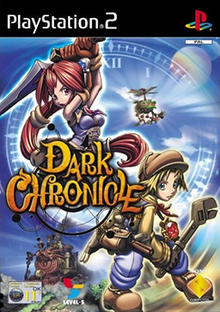 Dark Chronicle was named "Game of the Month" for February 2003 and given an "Editor's Choice" award by IGN, which in 2010 placed it at #31 in their "Top 100 PlayStation 2 Games". ^ a b "Dark Cloud 2". Level-5. Archived from the original on March 14, 2014. Retrieved May 31, 2012. ^ "Dark Chronicle". Eurogamer. Archived from the original on September 24, 2015. Retrieved May 1, 2015. ^ Holding, Sam (2003). "Playing the Game". Dark Chronicle Instruction Manual (UK). Sony Computer Entertainment. p. 8. SCES-51190. ^ a b c d e f g Hwang, Kaiser (February 14, 2003). "Dark Cloud 2 Review". IGN. Archived from the original on August 13, 2007. Retrieved July 5, 2007. ^ Holding, Sam (2003). "Combat". Dark Chronicle Instruction Manual (UK). Sony Computer Entertainment. pp. 22–23. SCES-51190. ^ a b c d e f Shoemaker, Brad (February 18, 2003). "Dark Cloud 2 Review". GameSpot. Archived from the original on October 31, 2013. Retrieved July 1, 2012. ^ a b c Jennings, Ronan (September 20, 2003). "Dark Chronicle Review". Eurogamer. Archived from the original on March 14, 2014. Retrieved February 16, 2014. ^ Holding, Sam (2003). "Upgrading Weapons". Dark Chronicle Instruction Manual (UK). Sony Computer Entertainment. p. 16. SCES-51190. ^ Holding, Sam (2003). "Upgrading Weapons". Dark Chronicle Instruction Manual (UK). Sony Computer Entertainment. p. 17. SCES-51190. ^ Holding, Sam (2003). "Georama System". Dark Chronicle Instruction Manual (UK). Sony Computer Entertainment. pp. 26–27. SCES-51190. ^ Holding, Sam (2003). "Bonus Activities". Dark Chronicle Instruction Manual (UK). Sony Computer Entertainment. p. 29. SCES-51190. ^ Holding, Sam (2003). "Invention System". Dark Chronicle Instruction Manual (UK). Sony Computer Entertainment. pp. 18–19. SCES-51190. ^ Holding, Sam (2003). "Bonus Activities". Dark Chronicle Instruction Manual (UK). Sony Computer Entertainment. p. 28. SCES-51190. ^ Holding, Sam (2003). "Bonus Activities". Dark Chronicle Instruction Manual (UK). Sony Computer Entertainment. p. 30. SCES-51190. ^ Level-5. Dark Chronicle. PlayStation 2. Sony Computer Entertainment. Monica: An origin point is where something begins. Like a flower. You first have to plant the seed into the soil before it will bloom. In that case, the action of planting the seed is the origin point of the flower. In that way the flower is the history that springs from the origin point. In the same way, all things that happen in the future have their origin point in the past. But if that origin point is changed, the results can be terrible. And that's what Griffon has done. Griffon has sent his henchmen to this time, altering the origin points of my time. And now he is rewriting history as he sees fit. In my time, this forest was where the Elder of the spirits, Jurak, lived. He was very wise and powerful. His great power purified the forest and gave vitality to all the living things in it. But Griffon erased Jurak from existence. And not only Jurak, but all those who have the power to challenge Griffon are being erased from existence too. ^ Varanini, Giancarlo (April 9, 2002). "New Level 5 game announcement". GameSpot. Archived from the original on October 31, 2017. Retrieved February 1, 2014. ^ Lopez, Miguel (May 16, 2002). "Dark Chronicle site launches". GameSpot. Archived from the original on October 31, 2017. Retrieved February 1, 2014. ^ a b Smith, David (May 16, 2002). "Dark Chronicle". IGN. Retrieved February 1, 2014. ^ "E3 2002: Dark Cloud 2". IGN. May 21, 2002. Retrieved February 1, 2014. ^ Gerstmann, Jeff (May 21, 2002). "E3 2002: Dark Cloud 2 announced for US release". GameSpot. Archived from the original on October 31, 2017. Retrieved February 1, 2014. ^ Smith, David (May 22, 2002). "E3 2002: Dark Cloud 2 Impressions". IGN. Retrieved February 2, 2014. ^ Lopez, Miguel (May 23, 2002). "E3 2002: Dark Cloud 2 impressions". GameSpot. Archived from the original on October 31, 2017. Retrieved February 2, 2014. ^ Komanoya, Rico, ed. (2004). "Dark Cloud 2". Japanese Game Graphics: Behind the Scenes of Your Favorite Games. New York: Harper Design International. pp. 98–103. ISBN 9780060567729. ^ "Dark Chronicle Original Sound Tracks" (in Japanese). Amazon.co.jp. Retrieved February 14, 2016. ^ "Dark Chronicle Premium Arrange" (in Japanese). Amazon.co.jp. Retrieved February 14, 2016. ^ Rad, Chloi (September 14, 2015). "Dark Cloud 2 and Other PlayStation 2 Games Get PS4 Ratings in Europe". IGN. Archived from the original on January 15, 2016. Retrieved January 20, 2016. ^ Blake, Vikki (November 20, 2015). "Sony Confirms PS2 Emulation is Coming to PlayStation 4". IGN. Archived from the original on January 24, 2016. Retrieved January 20, 2016. ^ Hussain, Tamoor (November 20, 2015). "PS2 Emulation Confirmed For PS4". GameSpot. Archived from the original on January 20, 2016. Retrieved January 20, 2016. ^ Osborn, Alex (December 3, 2015). "PlayStation 2 Emulation for PS4 Details Leaked via Dark Cloud Trailer". IGN. Retrieved January 20, 2016. ^ Te, Zorine (December 3, 2015). "PS4 Getting 1080p Dark Cloud Via PS2 Emulator". GameSpot. Archived from the original on January 14, 2016. Retrieved January 20, 2016. ^ Yoshida, Shuhei (December 5, 2015). "Fan-Favorite PS2 Games Launching on PS4 Tomorrow". PlayStation Blog. Archived from the original on December 21, 2015. Retrieved January 20, 2016. ^ Osborn, Alex (January 14, 2016). "Dark Cloud 2 Comes to PS4 Next Week". IGN. Retrieved January 20, 2016. ^ Hussain, Tamoor (January 15, 2016). "Dark Cloud 2 is the Next PS2-on-PS4 Release". GameSpot. Archived from the original on January 17, 2016. Retrieved January 20, 2016. ^ Totilo, Stephen (October 2, 2009). "Level 5: More People Need To Ask For A Dark Cloud Sequel". Kotaku. Archived from the original on March 7, 2018. Retrieved March 6, 2018. ^ Totilo, Stephen (March 23, 2010). "Nine People Want Me To Make Dark Cloud 3". Kotaku. Archived from the original on March 7, 2018. Retrieved March 6, 2018. ^ Totilo, Stephen (December 12, 2012). "Sorry, I Still Haven't Made Dark Cloud 3. Despite Your Requests". Kotaku. Archived from the original on March 7, 2018. Retrieved March 6, 2018. ^ Taro Uehara (May 23, 2017). "レベルファイブ、ゲームと玩具連動で再びブーム作れるか" [Can Level 5 find success again by connecting toys and games?]. Nikkei Business Publications (in Japanese). Archived from the original on October 17, 2017. Retrieved March 6, 2018. ^ Davison, John (May 23, 2017). "Level 5 Working on a Switch Game, Sadly Probably Not 'Dark Cloud 3'". Rolling Stone. Archived from the original on March 7, 2018. Retrieved March 6, 2018. ^ Frank, Allegra (August 22, 2017). "Level-5 wants another Dark Cloud as much as you do". Polygon. Archived from the original on March 6, 2018. Retrieved March 7, 2018. There has been a lot of requests and voices to create a Dark Cloud 3 or some form of Dark Cloud. That IP is co-owned or managed by Sony Computer Entertainment, so it’s not something that we can do or act upon on our own. ^ a b "Dark Cloud 2 (PlayStation 2)". Metacritic. Archived from the original on December 30, 2012. Retrieved June 20, 2013. ^ "プレイステーション2 - ダーククロニクル". Famitsu (915 Pt.2): 82. June 30, 2006. ^ a b Liu, Johnny (February 1, 2003). "Dark Cloud 2 Review". Game Revolution. Archived from the original on March 14, 2014. Retrieved January 25, 2014. ^ a b Nutt, Christian (March 6, 2003). "Dark Cloud 2 Review". GameSpy. Archived from the original on March 14, 2014. Retrieved January 25, 2014. ^ a b Bedigian, Louis (February 24, 2003). "Dark Cloud 2 Review". GameZone. Archived from the original on May 7, 2010. Retrieved March 10, 2014. ^ "Dark Cloud 2 Review". Official U.S. PlayStation Magazine: 108. March 2003. ^ a b "Year in Review: Best PlayStation 2 Game". GameSpot. Archived from the original on November 7, 2012. Retrieved January 25, 2014. ^ a b Heller, Benjamin (March 6, 2004). "The AIAS Presents its Awards". RPGamer. Archived from the original on March 4, 2016. Retrieved February 15, 2014. ^ a b "Games: Adventure Game in 2004". British Academy of Film and Television Arts. Archived from the original on April 7, 2015. Retrieved May 12, 2014. ^ "2002 Top 50 Best Selling Japanese Console Games". The-MagicBox.com. Archived from the original on July 7, 2009. Retrieved May 25, 2009. ^ "Level-5: History and Products". Level-5. Archived from the original on December 15, 2013. Retrieved February 16, 2014. ^ "Top 100 Playstation 2 Games". IGN. Retrieved November 16, 2011. This page was last edited on 1 December 2018, at 04:52 (UTC).